Ah, emoji – the inexplicably viral feature that we can't live without. OK, maybe it's not so extreme for every user out there, but we've witnessed enough tweets in the past to know that a proper emoji keyboard can make or break a phone deal for some people out there. And for what emotion there still isn't an emoji, there's your standard ASCII. 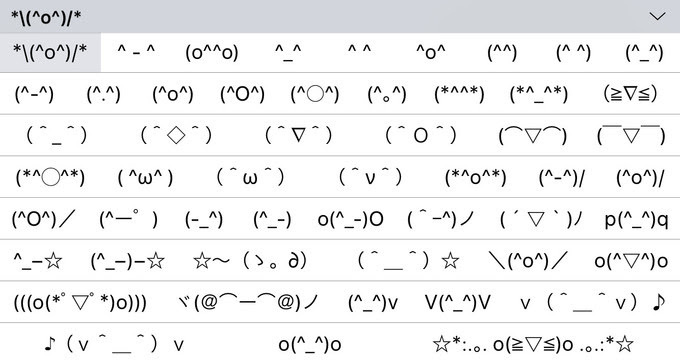 People have been using simple text symbols to create "faces" from the dawn of chat, and they continue to do so. Be it because it manages to look a bit more exotic than your standard emoji, or because the shrug emoji is still missing – the use of text-based smileys won't be dying any time soon. But drawing these is sometimes time-consuming, requires a perfect memory or a bit of imagination, and some knowledge of one's keyboard. Or, to put it in other terms, it's irritating to try and replicate that cool smiley your friend sent you the other day. But did you know that iOS actually has a hidden stash of text-based emoji hidden in one of its keyboards? Well, now you do, and if you follow a couple of simple steps, you will have the power to actually be that irritating friend with his unique smileys... right at your fingertips. You will be asked whether you want the Kana or Romaji style. For this example, we used Romaji, but either one will work out. Kana has a more confusing layout, however. Also, despite the fact that Romaji will appear like a regular English keyboard, do know that you can't use it to actually type, as it will transform your words into kanji. 5. Welcome to emoji land! That's it! Time to go wild with some unique emoji!